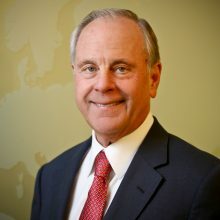 Thomas F. “Mack” McLarty, III is Chairman of McLarty Associates, which he co-founded in 1998 following a distinguished record of business leadership and public service, including various roles advising three US Presidents: Bill Clinton, George H.W. Bush, and Jimmy Carter. Mr. McLarty is also Chairman of the McLarty Companies, a fourth-generation family transportation business. As President Clinton’s White House Chief of Staff, Mr. McLarty helped enact the historic 1993 deficit reduction package, the North American Free Trade Agreement, the Family and Medical Leave law, and the landmark welfare reform legislation that enabled more than 6.8 million people to move from welfare to work. He also organized the successful 1994 Summit of the Americas in Miami, which ultimately led to his appointment as Special Envoy for the Americas in 1997. As Counselor to President Clinton, Mr. McLarty advised on a broad range of international and domestic issues. He traveled to the Persian Gulf on the president’s behalf to build financial support for the Bosnian peace process, led the US delegation to the inauguration of South Korean President Kim Dae-jung, and signed the peace accords that brought peace to Guatemala for the first time in three decades. Mr. McLarty planned US participation in the 1998 Summit of the Americas in Santiago, and participated in several G-7 and APEC Summits. Mr. McLarty is a frequent public speaker, and has published numerous articles on US trade and foreign policy. He has served on the boards of many corporate and non-profit institutions including as a Director of Union Pacific and the Acxiom Corporation, and on the boards of the Bush Clinton Katrina Fund, the Council of the Americas, the InterAmerican Dialogue, Ford’s Theatre, and the Center for the Study of the Presidency. In addition, he serves as a Senior International Fellow at the US Chamber of Commerce and is a member of the Council on Foreign Relations.